While getting ready for work this morning, I glanced out to see several 'colored' birds amongst the black birds that descend in hoards around my yard. 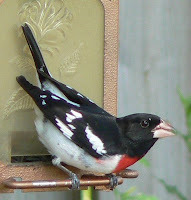 Three were Rose-breasted Grosbeaks! I think that may have been a first...seeing more than one Rose-breasted at a time. Two males and a female were feeding together. 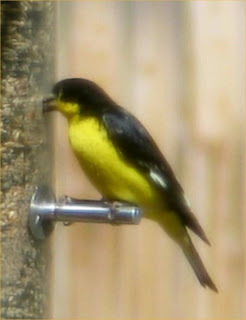 Yesterday, I could have sworn a Black-headed Grosbeak flew across the yard...but it was a blur. Today, I identified the pretty thing...another FOS! Last year they must have nested nearby; I watched nearly full-grown youngsters beg for feeding at the feeders. Sweet! And while watching the tiny little Lazuli Bunting feed, I looked up to see several other big-beaked birds; Evening Grosbeaks. Have you ever listened to them? To my ears they sound like chicks; they peep! I love to listen to them; they're one of the few birds I can identify by sound. 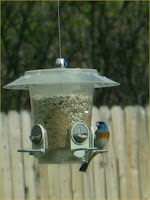 Lazuli Bunting: In the Yard! These guys remind me of Dark-eyed Juncos with their dark, smudgy eyes. The bird is quite small, only about five and a half inches long. The stunning, blue body (though smaller), with white belly and orange breast band remind one of a Western Bluebird. 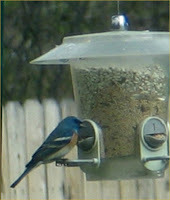 Here in SoCo, we sometimes get all three bluebirds; Mountain Bluebirds (males are intense sky-blue from stem to stern), Eastern Bluebirds, a bit smaller and with a rufus collar and bib above a white belly, which runs down the flanks; and the Western Bluebird (the smallest at only 7” long)…a blue bird with chestnut collar and shoulders; sometimes making the back look reddish. Its belly is also white. But is only the Lazuli Bunting which has two white wing bars; besides it is nearly 25% smaller than the larger thrushes (bluebirds). Also, while a subtle observation, the little bunting seems to sit straighter on a branch, than do the bluebirds. You can find some of last year's Lazuli Bunting posts and photos here. More pictures, including larger versions of these thumbnail images, are available at Google images. My friend Amy said she’s had a Rose-breasted Grosbeak visiting the last couple of days. Thanks to her, I’ve been on the lookout for one of the beautiful, black and white-backed birds with the large, blood-red triangle on a snow-white breast. We often get First of Season (FOS) birds within days of each other. Amy lives in Aguilar, not all that far from La Veta, really; about a 30 mile drive, but only 15 as a bird flies. (Yes, we’re that rural). I grow a lovely plant called a Bleeding-heart, which has heart-shaped flowers with a small bit at the tip of the heart…which adds to the look that the ‘heart’ is bleeding. This male bird’s breast reminds me of that, as the tip of its heart-shaped mark ‘drips’ down the middle of its breast; a stunning bird. 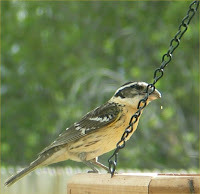 I couldn’t find a photo of the female Rose-breasted Grosbeak, but they are very similar to this shot I took of a female Black-headed Grosbeak (below). 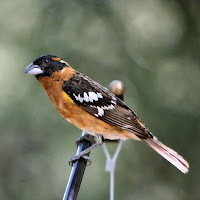 However, the Black-headed Grosbeak has paler, narrower and less streaking on the under parts, especially at the center of the breast, which is more yellowish-buff than the whiter female Rose-breasted. Also, the female Black-headed Grosbeak’s head and nape are more yellowish-buff and it sports lemon-yellow under the wing…rather than the paler, buffy-yellow of the female Rose-breasted’s wing linings. I dunno, female birds are generally less spectacular, more like plain, brown birds, but I find these large females rather pretty, in spite of the large schnozz. 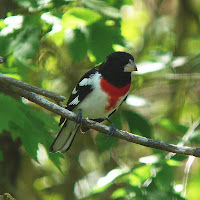 You can find a bit more info and more photos of the Rose-breasted Grosbeaks in my yard on last year’s blog postings here. You'll also get an idea of the mix of birds I'll likely see in my yard over the next month or so. Lordy, I do love springtime! Google has lots of images of this bird here. Except where noted, photos from Wikipedia. First of Season birds are fun to find and important to birders and scientists who follow migration information and data. As a ‘Citizen Scientist’ of sorts, I also find it interesting to track the arrival dates of my backyard birds. 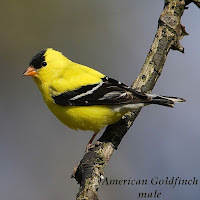 Late yesterday afternoon, I came home to find a couple of the season’s first Lesser Goldfinch feeding with the hundreds of Pine Siskin and American Goldfinch I have in my yard. I just love these stunning birds; the ones here have the dark, black backs associated with the Eastern variety of the species. 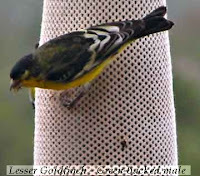 Supposedly, the ‘green-backed’ Lesser Goldfinch are the more Western variety, though it is noted ‘black-backs’ occasionally are found further west. This first photo is one I took last year on June 1st, the first time I'd seen them. They seem to be a month earlier this year...but then I was so new then; perhaps I just never noticed them. I think for awhile, I thought these tiny finches were displaying the difference in male and female Lesser Goldfinch; it took awhile to realize there are two varieties. Males of both varieties are, as usual, more colorful; brilliant yellow below, with dark wings which are white at the base of the primaries. As the name suggests, green-backed Lesser Goldfinch are a dusky-green above; along the neck and the entire back is greenish…only the top, front of the head to the bill (not unlike an American Goldfinch) is black. The black-backed Lesser Goldfinch is black from the bill all the way to the tail; the entire upper body is dark…stunning against the pure, bright yellow of the lower half. These are our tiniest finch; only 4 ½ inches long and about 9.5 g…making them noticeably smaller than the Am.Goldfinch which is closer to 13 grams. You might also notice that this little goldfinch has a proportionally larger bill than do others. 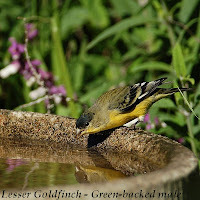 You can find a couple more (poor) photos I took of Lesser Goldfinch here, and pages of photos of them on Google, here. Yes, it's certainly time to put out those feeders; this morning I observed 4-5 hummingbirds, including at least one FOS Black-chinned Hummingbirds! As stated before, I can easily tell the difference between Broad-tailed and Black-chins at my feeders because Black-chins are smaller and are certainly quieter. While both males have greenish backs, the heads of Black-chins seem to be darker, the 'black' wraps up to or just above their eyes and further back on their heads...giving a bit of a helmeted look. I've read the Black-chin is the least colorful of hummingbirds found in the US...but I'm here to tell you that when the light hits him, the black chin of the so named hummer glows a brilliant and stunning purple. Of course, the most popular way to tell the difference between these two birds is to keep in mind Black-chins are 'tail-pumpers', a behavior you cannot miss while watching them. In flight of course, it is the 'cricket-chirping' sound of a Broad-tailed Hummingbird in flight that will let you know they're around. 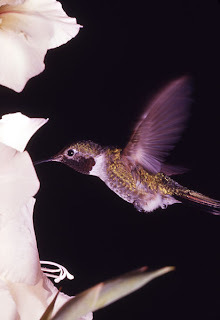 Hummingbird nectar: Bring a quart of water to boil, mix in a cup (or slightly less) of granulated, white sugar; bring back to a 2-minute boil, stirring to dissolve the sugar; cool, pour into a clean pitcher, cover and store in refrigerator. Fill clean feeders only as full as will be consumed in a few days. Oriole nectar is often made a bit less rich; using a cup of sugar to six cups of water...as above. However, making nectar is not a science...it even fluctuates within plants. Having said that, consider that the birds depend on the water-content in the nectar as much as the sugar itself. Hummingbirds prefer a 4-1 or even 5-1 (in hot weather) ratio of water to sugar. Too rich a mixture has been hinted to cause liver damage and affect reproductive success. You can find more of my own hummingbird posts and photos here. The other day I put up a nectar feeder for the soon-to-arrive hummingbirds. When I got home last night, my First Of Season Broad-tailed Hummingbird was feeding! The bird was a male, all decked out in breeding colors. Quite green on top, with a bright, almost cherry-red throat patch (gorget). It is amazing to me how different these birds look...depending on the light. The large photo here, makes the bird seem almost golden, when in fact it is quite green, and the gorget can look almost black sometimes, yet it is not. This humming bird is a creature of our Rocky Mountain meadows in the summer-time. The male Broad-tailed's wings make a cricket-like whistle in flight. The chin, under brightly colored gorget, is white, as is the belly. As I mentioned last year, one of the easiest ways to tell the difference between Black-chins (the tail-pumpers) and the Broad-tailed (the buzzers), when they're not buzzing or pumping, is that the Black-chins throat-colors seem to wrap further back on their heads and well up to the eye; giving them a darker-looking head. You can find more pictures here, where I found these thumbnail shots of the BTAH. You all have likely figured out that, while enthusiastic, I'm no espert birder. I try not to bore you with the 'usual' birds I find here. However...some of you might be interested in the fact that yesterday I discovered my FOS Brown-headed Cowbird (ugg) in the mix of a hundred or so otherblack birds (Red-winged, Yellow-headed, grackles and starlings). Do people 'follow' cow-birds...or just love to hate them? Anyway…about this `different' bird I noted: it looked to be a small sparrow, longish tail, very pale breast and quite distinct and long, thin, dark line across the side of the face; through the eye. Above that was a white eyebrow; making that eye-line particularly striking. The bill was darkish and there were no streaks on the breast. But what had brought my attention to it was thered on the head…which at first I wondered if it was dried blood; it wasn't redlike a Cassin's Finch…it was rufus like the breast of a robin or the back of an Oregon Junco. This coloring was somewhat mixed at the top and forward part ofthe head…mixed in with stripes, not unlike those of a White-crowned Sparrow. I ran for the binoculars. Looking more closely at the bird, I saw it was not blood, but natural, rufus coloring that seemed to be just coming in. I again noted the some what stripy coloring on the top of the head, the very, very pale breast and that beautiful, dark eye line. The rufus feathering was nothing like the brownish, checker-board-look of a young White-crowned Sparrow and it didn't have the dark-lined, white throat of a White-throated Sparrow, either. The bird took off when the black-birds sent another volley to the feeding place by the door; I'll try for a photo later. In the mean-time I've done some research. The bird's breast and flanks were paler than that of Rufous-winged and it lacked the throat strip of Rufous-crowned Sparrows. The bill was darker than that of a Field Sparrow and it lacked the breast spot of a Tree Sparrow. I believe I've identified my first Chipping Sparrow; one just loosing what appeared to be a crown-strip and coming into full breeding plumage with that beautiful rufus-crown. What else might it be? While that redish crown was not yet fully grown-in, I think it was the dark lores, with that bit of white, that added to my 'stripy head' interpretation. You can find lots of pictures of a Chipping Sparrow here. I love this time of year...my hands ache to be playing in dirt, I want to work in my garden. After a long winter of cold where most activities are indoors, I look forward to being outside; physically working...sweating. If ever I created 'resolutions' it would be this time of year. 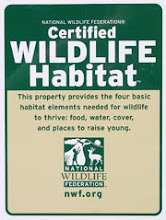 Go for it; plant a native bush that will feed wildlife and beautify your natural garden; dig up some turf and create another garden that requires less water and back-breaking labor to tend; collect some pinecones and dip or spread them with homemade suet; clean those feeders, drag out the nectar tubes...invite the birds and bees and butterflies to frolic in your yard! Oh my...I do love this time of year. Today, it's been gently snowing all day; fluffy, wet whiteness slowly piling up on trees and fence lines. This kind of weather brings birds down off the mountains; and I'm ready for them! I've got warm-ish water out so they don't waste energy eating snow. I've got the suet feeders full, I've got several kinds of feed...all in separate feeders spread out a bit in the yard; all where I can watch from my big bay window which looks out over the backyard. 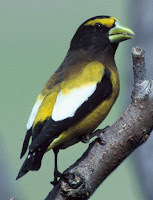 I've not seen many Evening Grosbeaks this year...but today about a dozen are here. What I love about these big finches is how their yellow bills change color during the breeding season to a beautiful blue-green. Sweet! And I finally had the first Cassin's Finch of the season visit. His bright red topknot and pale, pale belly make him easy for me to see he's neither a House Finch nor the Purple Finch...which is a bit streakier in the belly and looks to have been dipped in raspberry sauce! I just love these Cassin's Finch...so subtle and yet that spiky, red top belies an accomplished mimic. Who knew?